I’ve heard of Norwegian purling before but never went any further to investigate it. I found a YouTube video tutorial for it on one of my knitting groups and since I was doing some 1×1 ribbing I decided I would give it a shot. I’m sure it’s because I’m new at it, but I’m not seeing any time difference over bringing the yarn forward. It also may have been the yarn I was using (Noro Kureyon Sock), but my Norwegian purls seemed looser than my regular purls. Again, it could totally be the yarn, Kureyon Sock is by no means smooth and it was from a frogged project so it was a bit wavy to begin with. 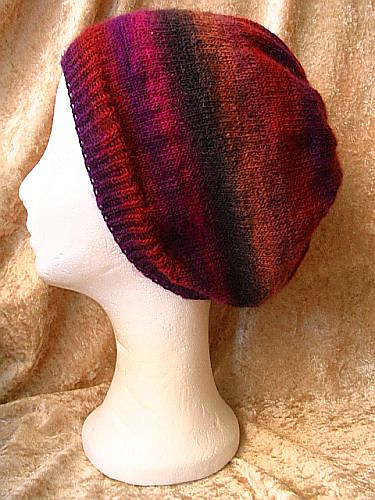 I’m going to wait and try it with some worsted weight yarn and see how it goes, until then the jury is still out. 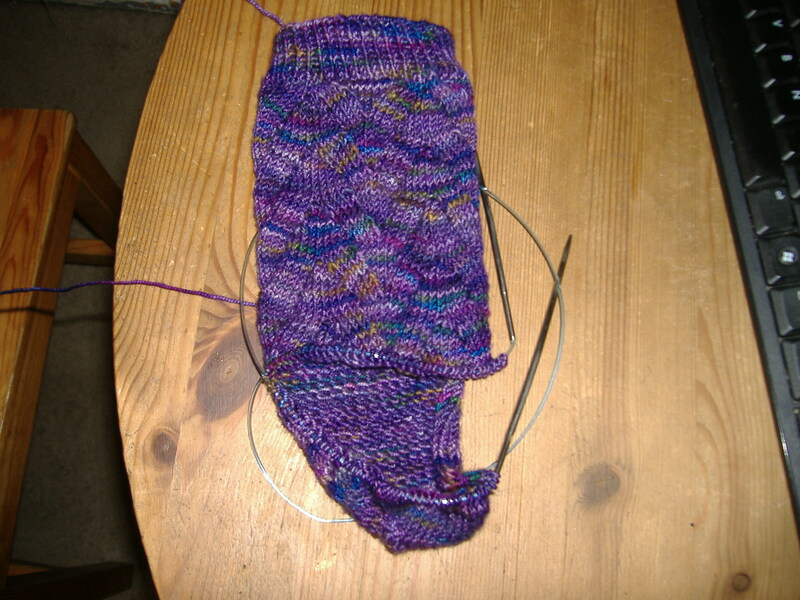 My No Purl Monkey socks are moving along nicely. I’m into the instep on the first one and I’m loving the way the Colinette Jitterbug is working up. The yarn is nice and springy and the colors are fantastic. 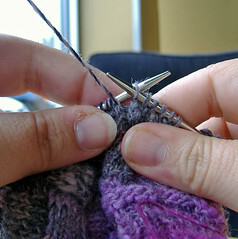 Here’s a picture of it before I finished picking up the heel flap stitches. I haven’t made much progress on the socks because I’ve been cheating on it with the Sock Yarn Slouch Hat. I’m using some Noro Kureyon Sock that I’ve had in my stash for ages and doesn’t match anything I own, but I like the colors and I need a hat in the worst way. I’ve made a few changes to the pattern. 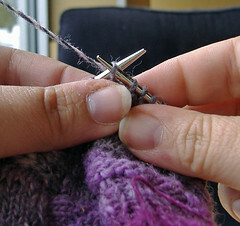 I’m using a size 3 (3.25mm) needle because that’s the smallest 16″ circular that I own. I changed the cast on to 150sts to accommodate my gigantic head and changed the increase to 50sts so I got a nice even number. 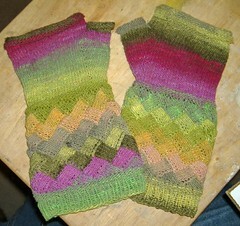 I have about two more inches to go before I start doing decreases. If I can keep up the pace, I should be able to be done with it by Monday or so at the latest. One of the side projects I’ve been working on for the past month or so is a bunch of patches for an afghan. Afghan patches are a great little side project – you can have lots of fun playing around with stitch patterns and get a nice break from your main project without having a million WIP’s (ask me how I know this). Oddly shaped patches aren’t an issue if it’s a crazy quilt style afghan but for a group project they can pose a problem since it’s much easier to deal with uniform squares and we always should be nice to the person actually willing to seam-up 200+ squares. Yes, you can always pick-up some stitches and add a few rows of garter stitch border to even out your squares, but that can be a bit on the tedious side with matching gauge and I can’t be the only one who thinks garter stitch in the round is a total PITA. 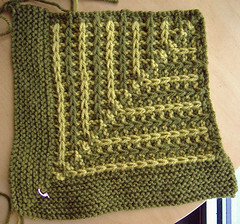 This where a couple of rounds of crochet can help – you get almost instant gratification, it’s much easier to frog back a row of single-crochets because the gauge is off rather than realizing it after a few rounds of garter, and crochet in the round has a uniform look to it so you don’t have to deal with the jogs in garter stitch. I was playing around with a mitred square and slipped stitches in this patch, but the slipped stitches affected my gauge and the square didn’t turn out to be the 10″ I needed it to be so I decided to add a mitered garter strip to make up the difference on realizing after it was done that my gauge was still way off and no amount of blocking would make it lay flat. I put it aside to knock out a few granny squares and then had the idea to try a crocheted edging. 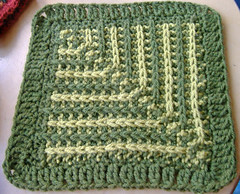 I had a few false starts where I had to play around with the spacing of some decreases to get my crochet gauge to match the square but I am very happy with the results. 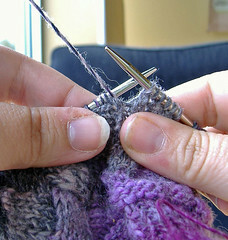 I saw entrelac knitting when I was first learning to knit and I thought it was the coolest thing ever. After a little bit of reading about it, I was put off by all of the hassle it entailed – picking up stitches and short rows looked like way too much work no matter how neat it looked. After the Quant pattern was published in the Winter ’07 Knitty and then Eunny Jang’s Entrelac Socks appeared in the Spring ’07 Interweave Knits I wasn’t quite as intimidated any more. My knitting group did a Quant-a-long and I joined in. After lots of frustration in the beginning, I did finally fall into a groove with it but was still annoyed that my knitting looked so sloppy. I never did finish that Quant (my son’s birth happened in the middle of it and I never picked it back up), but this past winter I made fingerless mitts with entrelac cuffs. 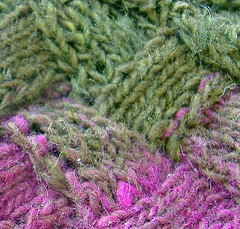 The beauty of Noro covers a multitude of sins, but I was still very unhappy with the finished look. Some more playing yielded slightly better results, but I was still unhappy with the look of the ssk’s and p2tog’s at the end of the short-rows. You can see the line of different colored stitches running beside the short-row decreases. I tried several different ways to get rid of it, but it was still there until I decided to try wrapping the next unworked stitch like I did after picking up the stitches at the start of each rectangle to close the gap between each building block. Instead of the decreases at the end of each short-row turning to the side and showing the stitches from the block below, everything now lays nice and flat. The wraps are just for structure and are not picked up and worked, the same way you don’t work the wraps in a garter stitch short-row heel on a sock. A little bit of extra work in an already fussy technique, but oh so worth it. Knitting Daily has “Entrelac – Beyond the Basics” by Eunny Jang available as a free download right now and it’s definitely worth snatching up since she has directions for both working entrelac flat and in the round. 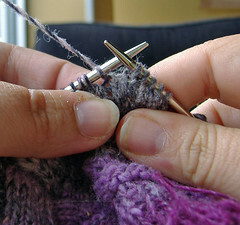 You have to register for Knitting Daily, but it’s free and a wonderful source for patterns and techniques. 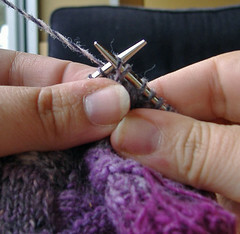 Bring your yarn backwards, slip next unworked stitch from your left needle to your right needle, bring yarn forward, slip wrapped stitch back onto left needle, turn work and work next row as written. 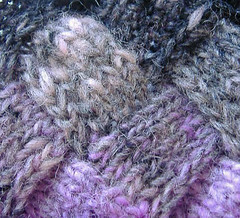 Bring your yarn forward, slip next unworked stitch from your left needle to your right needle, bring yarn backwards, slip wrapped stitch back onto left needle, turn work and work next row as written.